Henry Threadgill is a New York-based saxophonist, flutist, and composer. In 2016, he received the Pulitzer Prize for Music for his album, In for a Penny, In for a Pound. He is additionally the recipient of a 2016 Doris Duke Artist Award, 2015 Doris Duke Impact Award, 2008 United States Artist Fellowship, and 2003 Guggenheim Fellowship. 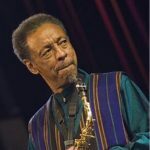 Threadgill was seventeen when he joined Muhal Richard Abrams’ Experimental Band, which later expanded into the Association for the Advancement of Creative Musicians (AACM).